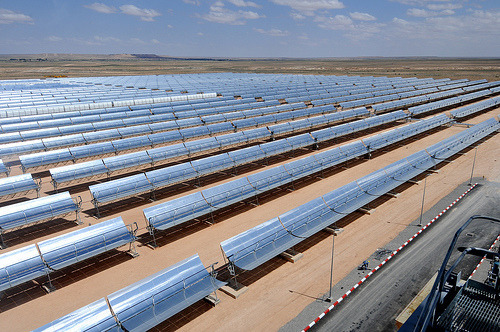 Ain Beni Mathar Integrated Combined Cycle Thermo-Solar Power Plant. Photo courtesy Dana Smillie / World Bank. Solar and wind power both promise clean, renewable energy to the world, but there is currently no good way to deliver the electricity these alternative sources produce to potential customers. But scientists are developing novel batteries based on nanotechnology that can save solar and wind power energy and provide it on demand safely, quickly and inexpensively. Fossil fuels like oil, coal and natural gas generate two-thirds of the world’s electricity right now. Concerns over their limited supplies and how they exacerbate global warming have spurred interest in greener, renewable sources of energy, such as solar and wind power. Unfortunately, the sun and the wind are erratic sources of power. Solar power is only generated in the daytime and diminishes with cloud cover, while wind power fluctuates from moment to moment. For example, in Tehachapi, Calif., the wind can generate a few billion watts of power at some moments and only a few million watts or even nothing at others, and peak power production is typically at night when customer demand is low. The inconstancy of solar and wind power typically requires that other power plants—often driven by fossil fuel—are brought in to compensate for their intermittent nature. To help alternatives stand on their own, researchers are now developing novel batteries to store energy on a massive scale. If their work is successful, energy that solar and wind power generates when demand is low can be stored for use when the need is high. Energy storage capabilities do exist on the vast scales of power grids, available for about 2 percent of the U.S. power grid, 10 percent of Europe’s and about 15 percent of Japan’s. Currently, these mostly do not rely on batteries, and involve using renewable energy to pump water uphill. When electricity is needed, the water is allowed to flow downhill and drive turbines, generating power hydroelectrically just as dams do. However, such pumped hydroelectric power is very energy inefficient, says materials scientist Yi Cui at Stanford University. Moreover, the method requires immense capital investments to build necessary infrastructure. Other strategies aside from batteries exist as well. For instance, renewable energy can be used to compress air that can later be used to drive turbines. However, this solution “must be supported by a fossil-fuel-burning plant,” Cui says. Energy can also be stored by making flywheels spin faster. When energy is needed, this stored rotational energy is converted to electricity. However, “they appear to be far too expensive,” Cui notes. A number of battery technologies have seen limited deployment on the grid, but these all have limitations as well. Lead acid cells are the least expensive of these, but are limited in their efficiency and in cycle life — that is, how many times they can get discharged and recharged. The lithium-ion and nickel-metal hydride batteries used in electric vehicles “are currently far too costly for use on larger scales,” Cui says. Other alternatives have drawbacks in efficiency, cycle life, the rate at which they deliver energy or other factors, he adds. Now Cui and his colleagues have developed a novel battery based on nanoparticles they say could be ideal for storing energy on large scales. They detailed their findings online in the journal Nature Communications. “What is exciting about this battery is its long cycle life, high power and low cost, which makes it ideal for grid-scale storage applications,” Cui says. The new battery has two main parts like other batteries— a positively charged cathode and a negatively charged anode. The cathode is made of crystalline particles of copper hexacyanoferrate roughly 50 nanometers wide, just 20 times thicker than a DNA strand. The anode consists of a mixture of activated carbon particles some 5 to 10 microns wide — about 10 to 20 times thinner than a human hair — and polypyrrole particles about 300 nanometers wide. The crystal structure of the cathode material contains large gaps that allow ions — the electrically charged particles whose movements en masse either charge or discharge a battery — to easily go in and out without damaging the electrode. Most batteries fail because of accumulated damage to an electrode’s crystal structure. This helps give the battery ultra-long cycle life, high energy efficiency and the ability to deliver significant amounts of power. The anode’s properties complement those of the cathode. The cathode and anode materials are all easily synthesized and involve cheap, readily available ingredients, and they operate in safe, inexpensive water-based electrolyte solutions, Cui says. “This technology can be easily implemented by lithium-ion battery production facilities,” he says.